In a new AutoCAD document (or existing document), Type units and then select “Architectural” in the Length box under Type. Select Ok when done. Now, turn off the “DYN” (Dynamic Input) button at the bottom of the AutoCAD workspace. Note: The Dynamic Input toggle will likely remain on for most of your work in AutoCAD. 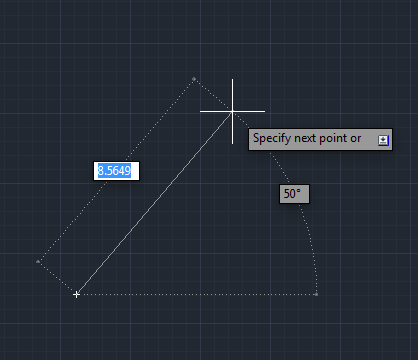 Turning it off here helps illustrate the coordinate systems available when working with AutoCAD. Select the polyline tool and type 0,0 as the starting point of your line. Your starting point will be the “origin” in a mathamatical xy plane. Next, type 0,24’ to create a line 24’ long along the Y axis (vertical). The coordinate you used is an absolute coordinate and references distances from the origin (0,0). The first number in the coordinate is the x value and the second number is the y value so 0,24’ would be 0 along the x-axis and 24’ along the y-axis. Now type 12’,24. You will notice a new line 12’ in the x direction and even with the previous y position (24’ along the y-axis). For the next coordinate, we are going to use relative coordinates. Relative coordinates temporarily create a new “origin point” that is the starting point (most recent point) of your current operation. To begin a relative coordinate, type the @ sign. Now type the coordinate of your new point relative to your current point. For example, Type @0,-6’. You will create a new line -6’ long in the y direction (down) from the previous point. Continue practicing with absolute and relative coordinates.